I have been told that Chiropractic can make me worse, is that true? What makes that “popping” sound? Are chiropractic doctors trained the same way as medical doctors? Can you receive adjustments if you have spinal disease or have had surgery? Once I start going to a chiropractor do I have to keep going for the rest of my life? I just don’t believe in chiropractic. Is it OK to see a chiropractor if I’m pregnant? Do chiropractors use vitamins or herbs in treatment? There is nothing mysterious about chiropractic. It is a natural method of health care that focuses on locating and treating the CAUSE of physical problems rather than just the symptoms. Chiropractic is based on this simple premise: with a normally functioning spine and a healthy nervous system, your body is better able to heal itself. Your nervous system controls feeling, movement, and ALL functions within your body. Chiropractic aims to improve nerve function naturally, without the use of invasive treatments like drugs and surgery. Yes. Chiropractic has an excellent safety record. It is a conservative and natural approach to health care that allows millions of satisfied patients to avoid harmful drugs and unnecessary surgery. As proof, one merely has to compare malpractice rates between chiropractors and other health care professionals. Chiropractic malpractice premiums are just a small fraction of those for medical doctors. A chiropractic adjustment is a specific force in a precise direction, applied to a joint that is “locked up” or not moving properly. The purpose of this safe and natural procedure is to eliminate interference to the nervous system, improving spinal function and overall health. Once the bones or vertebrae are restored to their proper position, the spinal cord and its nerves are no longer irritated and can work as they should. Remember that the nervous system makes EVERYTHING in your body work. Once the spine is “in-line” and no irritation is on the nerves or spinal cord, your body has the ability to be strong, healthy and if injured, heal. As with all types of healthcares, there are potential risks in the delivery of treatment. Chiropractic however, is a remarkably safe option. The key to safe and effective care is most often determined by the information the doctor gathers from you during your first visit to our office. During this first visit, your doctor begins by taking a thorough history to identify the nature of your problem. You will be asked detailed questions regarding your past and present condition and also receive a thorough examination so that we can determine how to best help you. Once all of this information is obtained, and before any treatment begins, you will receive a report on your test findings along with a program of recommended care. If we think that we can help you . . . we tell you that. If we think we cannot, we tell you that too. X-rays are taken for your own safety. Sometimes bad things show up on x-rays, such as old fractures, arthritis, scoliosis, bone spurs, and other problems that are important for doctors to be aware of. X-rays can ensure your best possible results in care. Ultimately, x-rays help doctors see what they need to see to help them design a program of care that’s just right for you. Actually, adjustments do not always produce a sound. However, some adjusting methods can produce a popping sound when the gases and fluids within a joint shift. This audible spinal release is similar to the noise created when opening a can of soda and the pressure is released. This sound is nothing to be concerned with and is completely harmless. No. Chiropractors have specialized training in many different adjusting techniques in order to provide exceptional care to all kinds of patients. Your adjustment and treatment plan will be custom tailored to best fit your condition and comfort level. Just like fingerprints, no two spines are exactly the same. Some factors that determine which type of adjusting techniques your chiropractor will use include: patient age, weight, preference, occupation, stress level, sleep quality, and of course spinal condition. 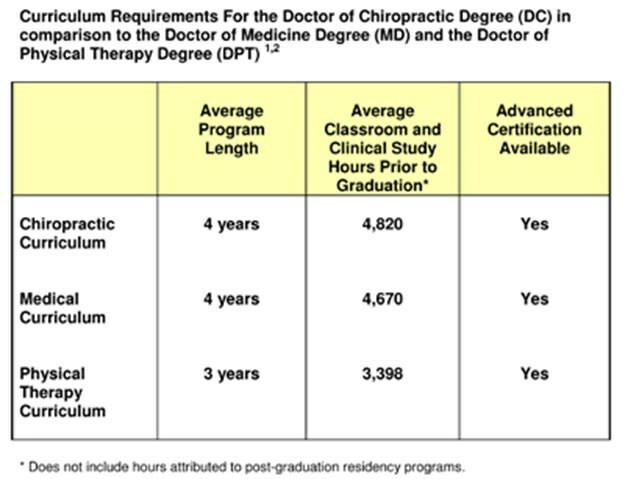 According to a National Health Federation survey utilizing curriculum statistics from 22 medical universities and 11 chiropractic colleges, the first two years of study to be a medical doctor or a chiropractor are very similar. The minimum number of hours for medical students studying classless like anatomy, pathology, chemistry, and other basic sciences is around 2750 hours. For chiropractors it is 2900 hours. During the last two years of medical school, students spend more time studying classes like pharmacology (prescription drugs) , general surgery and immunology while chiropractors learn more about adjusting the spine, nutrition and natural approaches to health. 1. Meeker W, Haldeman H. Chiropractic: A Profession at the Crossroads of Mainstream and Alternative Medicine. Annals of Internal Medicine 2002, Vol 136, No 3. 2. American Physical Therapy Association. 2005-2006 Fact Sheet, Physical Therapist Education Programs. January 2007. That depends on your particular case but in most instances, yes! It is an unfortunate fact that up to half of those who had spinal surgery discover a return of their original symptoms months or years later. They then face the prospect of additional surgery. This too common occurrence is known as “Failed Back Surgery Syndrome.” Chiropractic may help prevent repeated back surgeries. In fact, if chiropractic care is initially utilized, back surgery can often be avoided in the first place. No. If only it were, there would be more healthy people around and chiropractors would not get patients who last saw a chiropractor “a few years ago when their back went out.” It is possible to get used to feeling more balanced, less stressed, and more energetic as a result of regular chiropractic care. Of course not. Chiropractic care has long term benefits that many people choose to enjoy for the rest of their lives, much for the same reason that people eat right, exercise, brush their teeth, go to the dentist, or take vitamins for the rest of their lives . . . because it’s good for you! How long you decide to benefit from chiropractic care is completely up to you. You can choose to discontinue care just like you can choose to never brush your teeth again. It just depends on your personal health goals. For those of you who do not “believe” in chiropractic, that’s OK. Chiropractic is not a religion and it does not require your faith to work. Pregnant women frequently get results from chiropractic care. Chiropractors are trained in special techniques for adjusting pregnant women. Because of the inability to take medication for pain, the natural approach is a logical choice for pregnant women. More and more, obstetricians are referring to chiropractors due to the effectiveness of spinal adjustments for pain relief. Also, techniques designed to naturally reposition a breech baby are safe and effective. Lastly, women under regular chiropractic care have significantly faster deliver than those who are not. Regular checkups are helpful in monitoring spinal development as infants begin to sit up, support their heads, crawl and walk. Regular spinal checkups throughout childhood may prevent the development of chronic conditions later in life such as difficulties from scoliosis. Chiropractic adjusting procedures for children are modified making them more gentle, comfortable, and effective. Some do and some don’t. It has been our experience that you get out of life what you put into your health. Putting good vitamins, supplements, and minerals into your body is a healthy choice. We carry a complete line of physician grade supplements that can certainly assist you on your road to recovery.